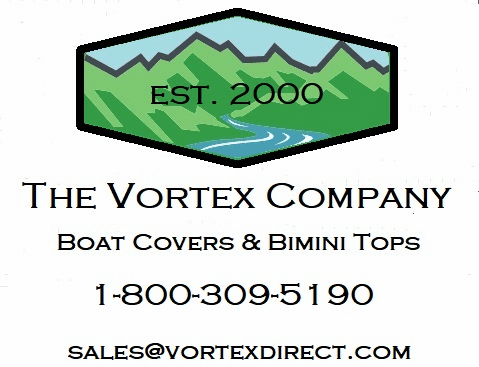 BOAT COVERS | VORTEX HEAVY DUTY CUDDY CABIN BOAT COVER 21'7" TO 22'6"
VORTEX HEAVY DUTY CUDDY CABIN BOAT COVER 21'7" TO 22'6"
For our Vortex Cuddy Cabin Boat Covers, they are sized like this. We carry several sizes. Each size will fit up to a certain beam, as listed above, in the title or heading of this listing. That beam is standardized based on industry standards of lengths and widths of boats. At the given beam that a cover is made for, it will cover that entire beam, plus about two feet or slightly more down the sides all the way around. For example, our 18'7" - 19'6"’ cover is for up to a 102” beam. So, if your beam is 102”, the cover will cover the top of the boat, and down the sides about a foot all the way around. If you boat has a 102” beam, then you can expect the cover to cover the top, and about 2 feet all the way around. We currently have 5 sizes of cuddy cabin covers: Each size has dimensions strategically figured based on the industry standard sizes of boats in that size range. As always, if in doubt, please call us. We will be glad to help. HERE IS WHAT YOU CAN EXPECT FROM US. 1. ITEM YOU RECEIVE WILL BE WHAT YOU SEE PICTURED AND DESCRIBED. 2. WE ARE EASY TO GET IN TOUCH WITH...YOU CAN EMAIL US OR EVEN CALL US DURING THE HOURS ABOVE AT 1-800-609-9457. 3. WE WILL SHIP PROMPTLY. WE SHIP 5 DAYS PER WEEK. WE SHIP VIA UPS GROUND, FEDEX GROUND, AND US POSTAL SERVICE , AND AVERAGE DELIVERY TIME IS 1-5 DAYS, DEPENDING ON YOUR DISTANCE FROM US. WE ARE CENTRALLY LOCATED IN THE U.S. AND WE HIT 34 STATES WITHIN 2 BUSINESS DAYS. WE TAKE SHIPPING PROMPTLY VERY SERIOUSLY. 4. SHIPPING CHARGES ARE FAIR. SHIPPING IS FREE ON THIS ITEM. WE SHIP VIA UPS GROUND, FEDEX GROUND, AND USPS PRIORITY MAIL..OUR CHOICE. These are the best boat covers available. They are suitable for STORAGE, MOORING, AS WELL AS TRAILERING. The cover is made from marine grade polyester. The cover is made from 7.8 oz/600d/600 denier solution dyed polyester. 'Solution died' simply means that the thread is dyed before it is woven into the material, as opposed to the fabric being woven or produced, then dyed. This process allows for better penetration of the dye, and better colorfastness. This makes the cover very resistant to fading. The fabric is then coated twice with polyurethane on the bottom or downside, UV protected, and mildew protected. What this all adds up to is the best cover available. It is nearly twice as thick as what you see readily available commercially. It is designed to keep water out, as it is WATERPROOF. Yet, water vapor can permeate it, so it will keep moisture out, but will not keep moisture in! Our covers come with tie down/hold down straps, as well as a storage bag. For certain applications, such as higher speed trailering, you may need to add extra straps. 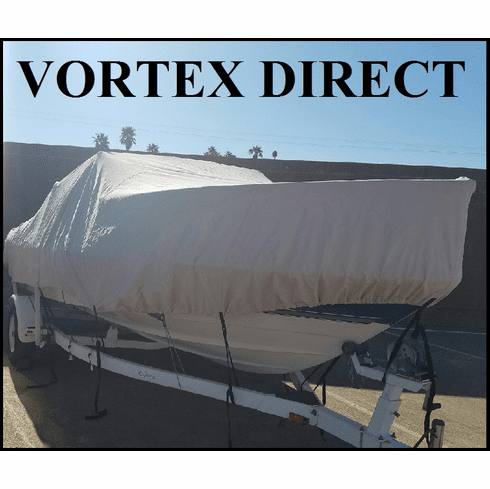 The material is heavy duty enough to support any reasonably paced trailering, but you have to eliminate the movement of the cover, which is very difficult. It is generally better to trailer uncovered, as it is just normally not worth the effort to prep a covered boat for trailering. These are very waterproof. These will collect water. If you are going to use this for storage or in any condition on your boat where rain could collect on it, we would highly recommend some type of support system. Support systems are readily available online. It does not have to be anything incredibly complex, just enough to create and arch so it can shed rather than collect water. A very common and economical way to do this is to build a support system or 'skeleton' with pvc pipe. Grey electrical conduit works very well and is even less expensive. People have used saw horses, an empty garbage can or two., etc. Often, you do not have to spend any money on a support system. Shipping is free to anywhere in the contiguous United States. For shipping to anywhere else, please contact us. Please see pictures. This is not a disposable type cover. It is made for years and years of use. It has a 5 year warranty. Copyright © 2000 VortexDirect.com All Rights Reserved.